Once again DC Alpha is opening our home for the summer for our brothers who are interning in the DC area. With the change of administration there is a lot of activity here in the nation's capitol. 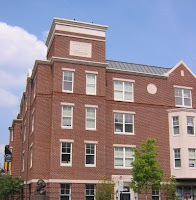 DC is a beautiful city and our home on the George Washington University campus is only a 10 minute walk from Barack and Michelle's little place on Pennsylvania Avenue. The city offers more free entertainment than any city in the world. Metro (subway) is available 5 minutes from the house. A car is not necessary if you are working in the city. Everyone should visit Washington, DC at some time and this is the opportunity. While the local AVC has no control over the costs and dates available for occupancy we do need to keep the house full during the summer. The house is owned and operated by GWU. As of now about 2/3 of the capacity has been spoken for so if someone is interested in living in DC for the summer they need to act quickly.